A collection of authentic racing Jaguar E-types will be assembled at the Goodwood Revival in September to celebrate the iconic car’s 50th anniversary. 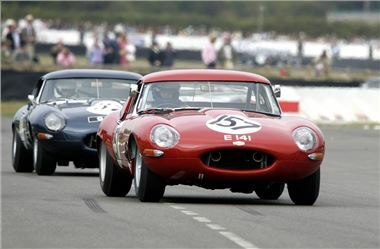 The exclusive Goodwood Fordwater Trophy will feature an all E-type grid, all of which originally raced before 1966. It’s to be a 45-minute two driver race with changes between 15 and 30 minutes. The driver line-up includes F1 stars Gerhard Berger, Jackie Oliver, Jochen Mass, Adrian Newey, Desiré Wilson and Tiff Needell, touring car racers Andy Priaulx, John Cleland and Anthony Reid, ex-Jaguar Le Mans winner Andy Wallace and actor and comedian Rowan Atkinson, who hit the headlines today after crashing his McLaren F1 hypercar. He isn't severely injured. You can order tickets for the Goodwood Revival at the Goodwood website.